Affordable Pest Control offers affordable pest control and removal services for seasonal ants, cockroaches, flies, fleas, mice, rats, wasps, centipedes, spiders, raccoons, squirrels, birds, and more. Their animal removal services are all humane to ensure both the homeowner and the animal are left unharmed. 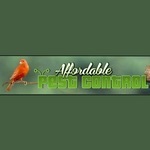 The staff at Affordable Pest Control realizes that any critter problem can be a stressful and often embarrassing situation for any family however. Thus, the company has an expert team to deal with a wide array of animal removal services, making sure all of their customers are well cared for. With over 10 years of combined home pest control experience, the company will always make sure that each and every one of their customers is left satisfied. Affordable Pest Control’s residential pest control services are individually tailored to suit their customers and are all backed by a written guarantee. Their offices in the Durham region offer customized pest control services for all commercial establishments like restaurants and hotels, malls and convenience stores, property management companies, factory floors and warehouses. The company’s tailored pest control services include standardized inspections, long-term maintenance and in-depth reporting of all pest issues and status of service for each client quote. They offer no set-up fees, no contracts and guaranteed pricing. The company customizes their plans to suit their customers’ every need so that they only pay for what is required. Affordable Pest Control’s specially trained technicians will always arrive at a time that is suitable for both parties and will ensure that they get to the root of the problem. Known for the lowest rates in the Durham Region when it comes to industrial pest control, Affordable Pest Control will match and beat any competitor by at least 10%.